‘I glance over and look at my watch, sitting next to me on the bedside cabinet – 1.17am. Not an ideal time to be wide awake, particularly after a hard day on the bike. After using a decent amount of mental and physical energy I should be sound asleep, but instead I’m lying with my eyes open, buzzing like I’ve just got off a roller coaster, my brain whizzing at a million miles per hour. I do a quick mental list. Nepal, Tibet, India, Morocco, French Alps, French Pyrenees, Spanish Pyrenees, Cuba, Italy, USA, Canada, Jamaica, Iceland, Swaziland, Vietnam, Turkey and last but not least, the UK. It turns out that in the 17 years that I’ve worked in the adventure travel world (first as a mountain bike guide, then as a guide trainer and now as an adventure filmmaker) that I’ve been lucky enough to mountain bike in 16 different countries. So, where’s the best place I’ve ever ridden you might ask? The slickrock trails of Moab? High-altitude singletrack in the Lo Mustang region of Nepal? Ancient donkey trails in Morocco’s High Atlas Mountains? Lift-accessed colour-graded enduro trails in the Alps? 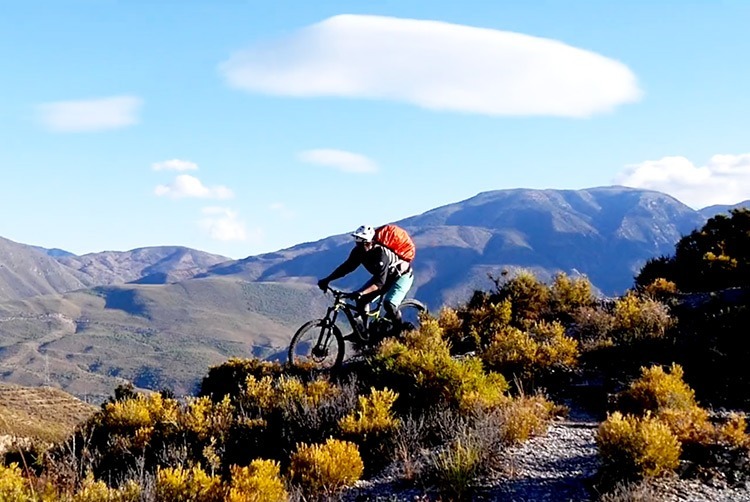 As I lie in bed, with endorphins still rushing around my body, I decide that the flowing technical singletrack trails of Spain’s Sierra Nevada mountains are now my all-time favourite. 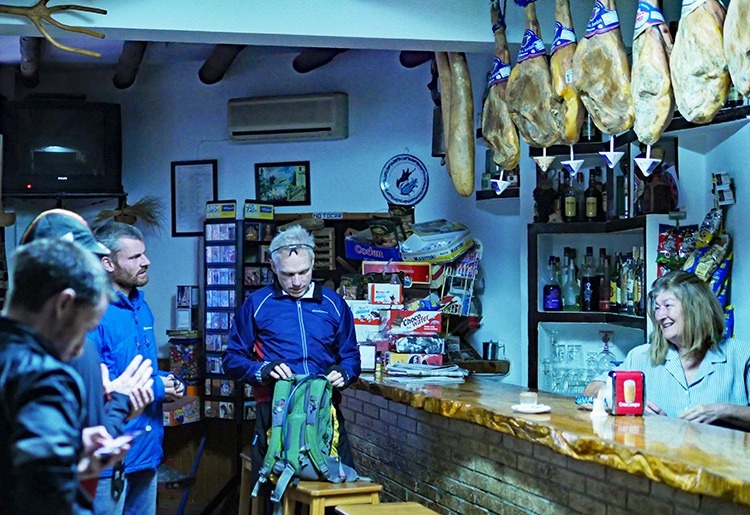 When Saddle Skedaddle first asked me if I’d like to go out to Spain to film with a group of mountain bikers on their Sensational Sierra Nevada trip, I didn’t need to give it much thought before signing up! In my mind’s eye, I pictured a ribbon of singletrack flowing down a mountainside, linking one ancient whitewashed village to another. As a filmmaker, I try to visualise in 3D what the terrain will be like and tried to think how I could film it – how could I capture some of the buzz of riding through such incredible scenery? I’d been on holiday in the same area with my wife and our road bikes a few years previously. 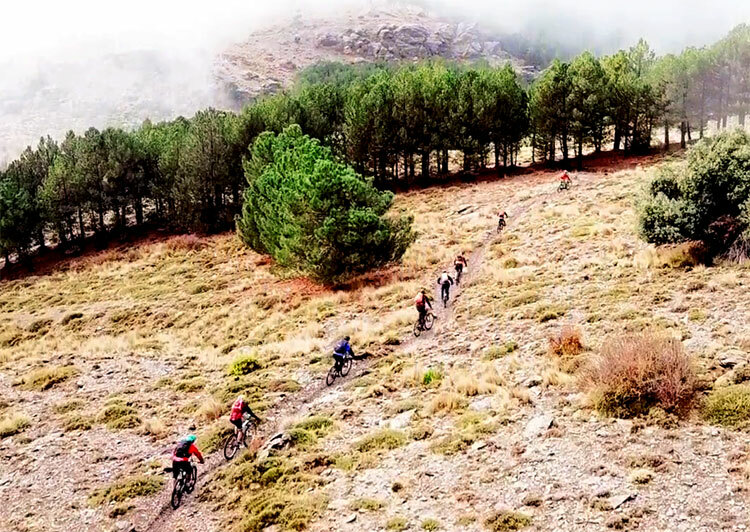 While we pedalled on smooth tarmac, I’d spotted little snippets of singletrack heading off into the hills, and often wondered where these trails went and whether they had that mix of challenge and flow that mountain bikers crave. My first introduction to what lay ahead was an audible one, rather than visual. I had all my camera gear set-up and was recording Mika, Skedaddle’s amazing travelling chef, who was busy preparing lunch for the group in a small square in the centre of a tiny mountain village. As I concentrated on capturing the essence of what Mika was doing, I heard a distinctive whizz-whoosh-thud. I glanced to my right to see Dan, Skedaddle’s head honcho in Spain, riding at speed towards me. There were three small flights of steps on the path that he was riding and he was jumping each one then coasting the flat section between, before jumping the next set. On his wheel was a small group of riders, all confidently (if slightly more cautiously) following Dan’s line down to the lunch spot. As the group arrived, parked their bikes and took off their helmets, there was a tangible air of excitement from them. 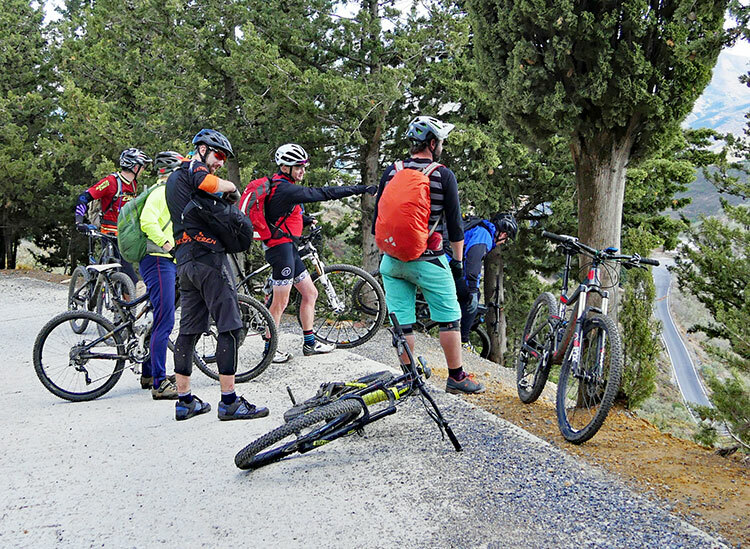 As I introduced myself to everyone, I could feel how much fun they’d been having – they had a slightly wild-eyed and hyper look which I recognised well – it was the sure sign of mountain bikers who’d had a pretty amazing journey from breakfast to lunch that day! Dan and his trusty lieutenant Ludo had managed to find that perfect sweet spot between pushing the group to their limit, but keeping everything safe and under control. With Mika’s amazing lunch speedily dispatched, I packed my camera kit into my backpack and saddled up to join them on the afternoon’s adventures. Sadly, the scorching sunshine that I’d been sweltering under the previous few days whilst filming further north in Spain had evapourated and in its place, was thick cloud and cooler temperatures. The lower temperatures were a relief to the group, who had got a little cooked the previous day, but from a filmmakers’ point of view, grey skies and dull light was less than ideal. I mentioned this to Dan and he didn’t seem worried – he said the quality of the riding and the scenery in the afternoon would make up for the flat light. After a short climb on a vehicle width gravel track through a huge area of forest, we reached what looked like the edge of the world. Peering over the edge, Dan pointed out an incredible looking section of singletrack perched on the far side of the valley a long way below us. The trail ran from as far as we could see from the right, descending to the left, heading for a dramatic looking gorge and then disappearing out of sight. OK, so it was grey, not very warm and the light was pretty flat, but that ribbon of singletrack was stunning and everyone was buzzing just thinking about getting the chance to ride something so beautiful. I was already picturing how to go about filming it – definitely a perfect spot to unpack the tiny fold-up drone that I was carrying in my photographers’ backpack. Our route from the view point down to the far side of the valley wasn’t exactly shabby either. Perfect flowy singletrack, with some pretty steep pitches, a number of tight hairpin corners which required some confident body-English (push your weight forward, load the front fork and force the front tyre to bite more, slightly more front brake bias and let the back-end go light to help it glide smoothly around the apex of the corner) and some sections of bare slate and siltstone bedrock, entertainingly greasy after an earlier rain shower. Everyone made it down safely and we gathered at the bottom, thinking about the trail ahead. It started with a tricky off-camber singletrack climb – all rideable, but it needed pretty confident line choice and a good deal of subtle core movement to get the tyres to stick rather than spit traction. As we crested a small saddle the singletrack that we’d spied earlier from our high vantage point was now laid out in front of us. The trail was initially smooth, but Dan assured us that it got rockier, steeper and more challenging the further we descended. I persuaded Dan to let me go first, to get enough of a head start to get my film kit unpacked and ready by the time the group arrived. The afternoon was rushing by and the light was beginning to dim, so I knew it would be a bit of a battle to capture the incredible scenery and the stunning trail before it was just too dull to get anything worthwhile. As I set off I cranked my concentration up to maximum – riding in front of the group on a trail that I didn’t know, with thousands of pounds of camera kit in my pack is always slightly nerve wracking. It’s hard enough being a guide on this type of terrain, but when I’m trying to scope out a suitable film spot as the same time as descending at speed, it requires a huge amount of focus. After five minutes or so I found the perfect spot – a small flat section off to the side of the trail which gave me an amazing view back up the steep V-sided valley that our trail clung precariously to the side of, but also allowed me to see what was coming up next for the riders. I unpacked my portable drone and fired it up. While I was waiting for the in-built systems to warm up, I did a safety check – scanning all around me for potential hazards – power lines, trees affecting my line-of-sight, topography that might create wind turbulence – all things that I needed to consider before I could safely fly. As the drone bleeped to signal it was ready I heard the unmistakable sound of mountain bike tyres scrabbling for grip on slightly damp rock and travelling at speed. Sure enough, Dan soon popped into view, leading his group like a lightly-armoured Pied Piper. I got the drone up in the air and started to film, viewing the footage from the drone via a live feed to my smart phone. As the riders passed rapidly underneath me, I got them in my sights and tracked them down the trail. Chasing riders from the sky is a pretty amazing feeling – I can see pretty much everything that they can, but can also move the camera up and around for the ‘big picture’ view. The trail was everything that a modern-day enduro rider could want – challenging, fast, flowy, just enough rock slabs and steps to make it interesting and an amazing view around every corner. As the riders sped beneath me, I tried to capture the fun and the thrill of riding such an amazing trail. As the trail tracked the side of the valley, I could see in front a distinct rocky outcrop – elevated above the trail and with a great vantage point up and down the valley. As I flew closer I spotted a figure stood on this pinnacle – I realised that Dan had put in a decent burst of speed and had gone slightly ahead of the group, where he had stopped beside the trail. Dan was facing up the trail, towards the oncoming riders, who were bearing down on him fast. From the air, I couldn’t see (or hear) what he was saying, but I knew exactly why he was standing where he was – he wanted to stop the riders to warn them about what was coming up next. I could see from my vantage point in the sky what our next challenge was, but for the riders on the ground, the next section was completely unknown. Feeling inspired? 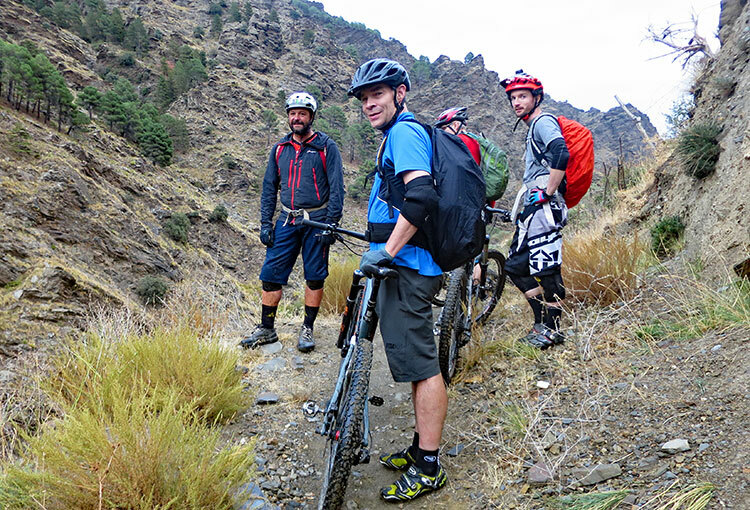 Olly joined us on the October departure of our Sensational Sierra Nevada mountain biking tour. Take a look at his thrilling and insightful film about the trip here.